It's hard not to love SetCPU developer Michael Huang. 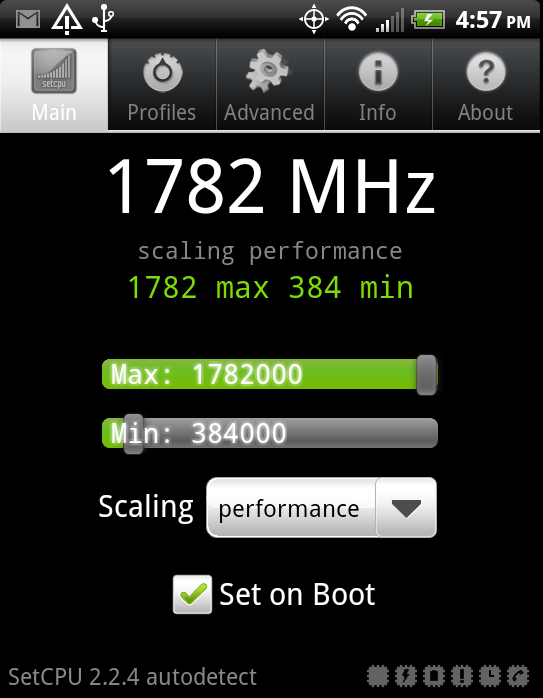 He's been on the overclocking frontline for many devices, including the Samsung Galaxy S II and Motorola XOOM, and now he strikes again with an custom tweaked kernel (update: to clarify, the kernel source isn't available, so this isn't a rewritten kernel - he used a hex editor to modify it) for the HTC EVO 3D that allows for a stable 1.8GHz. With a few minor tweaks the kernel should work for the Sensation as well, although he hasn't had time to get it working without a device in hand. Ludicrous speed indeed! He's also provided a 7-minute video in which he runs a series of benchmarks at both stock and overclocked speeds. Download the kernel module appropriate for your phone. If you're not sure which one to download, check /proc/version and find the version string and then check the part that contains the localversion, which is right after 2.6.35.10 and looks like this: "gb7a86da" or "gcb1cf83"
If you do not specify any parameters, the module defaults to 1512MHz and 1250000 uV! (scpll_l_val=28 vdd_uv=1250000) This should be safe for everybody, since that's the MSM 8x60's native speed (of the higher speed bin anyway). Mr. Huang also points out that the kernel allows for a clock as high as 2GHz, although at that speed things probably aren't very stable. Not using SetCPU? Consider it - it's $2, offers a host of features, and it's a good way to support a great dev. Alternatively, you can donate to him using PayPal. As always, any questions should be directed towards the source thread, as we can't provide much by way of support.